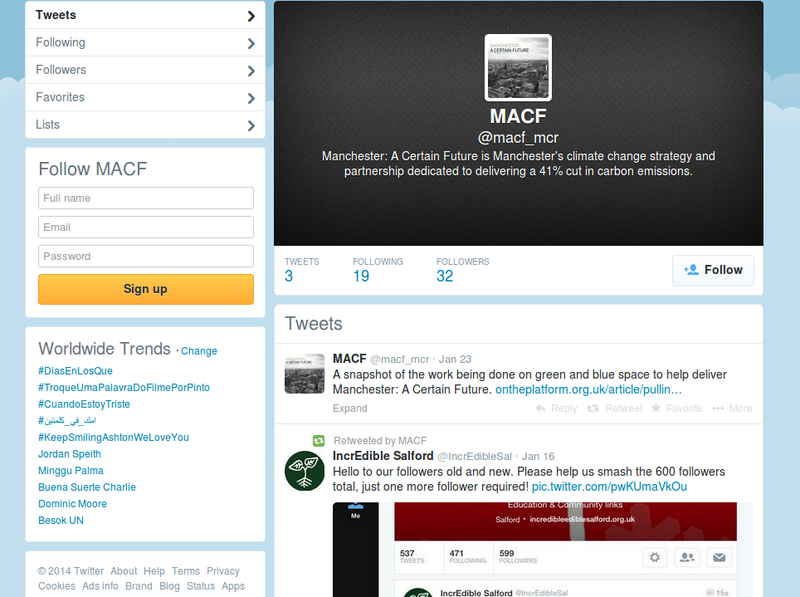 The high-profile and high-impact Steering Group for the Manchester Climate Change Action Plan has set up a Twitter account on January 17th. They managed a “hello look at us” tweet, a retweet and one twet on January 23rd. Since then, nowt. Oh, and you, um, you know, tweet, occasionally. 140 characters at a time. It ain’t War and Peace. But no, it all seems to have been too difficult. a) If the Steering Group won’t take on the challenge of getting more signatories and more implementation plans, what is it for? b) If the Steering Group won’t even mention the “low carbon culture” element of the Climate Change Action Plan in its twitter description, what is it for? What does that say about the status of goal two? c) If the Steering Group can’t even organise a decent twitter account, what is it for? Why should anyone take its organisational and motivational “capacity” seriously? The SG’s credibility is in tatters. When will someone do the decent thing and put it out of its own misery, (and that of the five or ten people in Manchester who are paying any attention?) The Low Carbon Hub is every bit as opaque, undemocratic and uninterested in issues of “low carbon culture”. But at least it has a Greater Manchester remit. Let’s just have one futile joke overseeing this whole tawdry nonsense, shall we? Pre-emptive disclaimer: Yes, MCFly has started and abandoned projects. But we have no secretariat (£10,000. For what exactly? ), and we don’t have 31 (or more lately, fewer) “high-powered” people sat around as potential “doers” either. On Monday, could you organise a statement please? can we have – for publication – answers to the following? 1. When was the decision to set up a Twitter account made? 1a. Were any targets set for how many followers it would have by date x or y, how many tweets sent out per month (presumably a number great than zero per month – which is what happened in February and March). 2. Who is responsible for running the twitter account? 3. Why was the “low carbon culture” element of the Climate Plan not included in the description on twitter? 3a. What does the word “dedicated” mean in the twitter description, given that the Steering Group has decided it doesn’t have the authority/resources/motivation to try to get more signatories/implementation plans? i.e., how is the SG expecting this 41% reduction to actually happen? 5. Is the account going to continue or be abandoned? 5a. If it is going to continue, how often do you expect tweets to happen? 6. Anything else you want to say on the Steering Group’s social media “strategy”. “As you know we’re in the process of updating all aspects of MACF including communications. The communications & events team(s) have been asked to develop a comprehensive ‘joined up’ communications & events strategy including ’embracing social media’ (at this point I can hear you laughing, loudly). The Twitter feed is a ‘Beta Version’ which was set up in response to this challenge. The communications & events strategy is being developed at the moment – which is why the Twitter feed is presently ‘on hold’ – but will be re-launched in the near future. MCFly- “Beta version?” Well, close, insofar as almost anything would have been a betta version. Surely the point of testing in beta is you fail fast, fail often and learn iteratively. What can possibly be learnt from that “beta”??? This entry was posted in Climate Change Action Plan, Democratic deficit, Steering Group. Bookmark the permalink.